In 2010, a non-native freshwater mussel species was discovered in Hunterdon County, NJ – the Chinese pond mussel (Sinanodonta woodiana, previously referred to as Anodonta woodiana). Not only was it the first time found in New Jersey, but it was the first documented occurrence within the entire US. A Chinese pond mussel. Photo by Mike Davenport. The Chinese pond mussel is native to eastern Asia. It is a large freshwater mussel, reaching a size of almost 1-foot across; which makes it the largest species now in New Jersey. New Jersey is home to 12 native species of freshwater mussel – you can learn more about their distribution on Conserve Wildlife Foundation’s freshwater mussel page. Additional non-native freshwater mollusks include the Asian clam and paper pondshell. The Chinese pond mussels discovered in New Jersey have thus far only been found within the ponds of an abandoned fish farm and an adjacent stream. They were most likely introduced by accident as “hitchhikers” on the Asian carp being farmed within the ponds (young mussels, known as glochidia, are parasites on fish and a few other aquatic vertebrates). The non-native mussels thrived within the ponds. Non-native mussels are a threat to native mussels because they compete with them for space and food. Out of 12 native species in New Jersey, 9 of those are classified as Endangered, Threatened, or Special Concern. The addition of the new potential threat of another invasive species is a great concern for the recovery of those 9 species. The ponds where the mussels were found were treated with the chemical rotenone, which eradicated the non-native carp as well as most of the mussels. 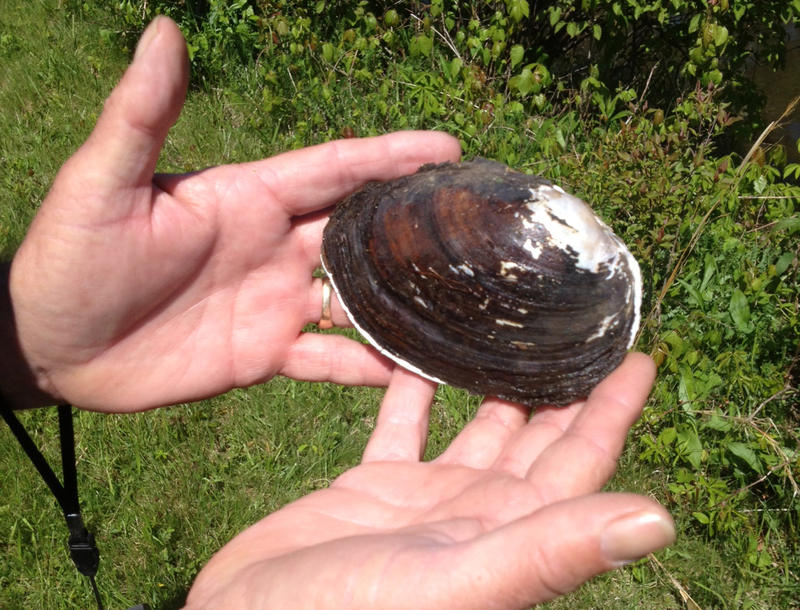 A survey by staff from the NJ Endangered & Non-game Species Program and CWF earlier this year, however, confirmed that the mussels are still within the ponds, although their numbers have been greatly reduced. The mussels could no longer be found in portions of the stream downstream of the ponds where they had been found in 2010. This is significant because the stream drains into the Delaware River. If the mussels were able to expand their distribution into the Delaware, opportunities to control their spread and establishment in the river would be much more difficult if not impossible. Although most experts aren’t certain of the full potential magnitude of a Chinese pond mussel invasion, we’re in a position right now to stop it in its tracks. Further monitoring and perhaps further chemical treatments will be necessary to keep yet another invasive species from becoming established in New Jersey.